The scalable Wisconsin map on this page shows the state's major roads and highways as well as its counties and cities, including Madison, the capital city, and Milwaukee, the most populous city. To display the map in full-screen mode, click or touch the full screen button. To zoom in on the Wisconsin state road map, click or touch the plus (+) button; to zoom out, click or touch the minus (-) button. To scroll or pan the zoomed-in map, either (1) use the scroll bars or (2) simply swipe or drag the map in any direction. (The scrolling or panning method you use will depend on your device and browser capabilities.) At any time, you can display the entire Wisconsin road map in a new window or print this page, including the visible portion of the map. Wisconsin's Interstate Highways connect its major cities and facilitate travel between Wisconsin and its neighboring states. I-43 parallels Lake Michigan from Green Bay, passing through Milwaukee before turning southwest to connect with I-90 near the Illinois border. Both I-90 and I-94 cross southwestern Wisconsin between Illinois and Minnesota. These two Interstates run together for a while northwest of Madison, but I-94 is generally routed north and east of I-90. I-794 links I-94 and I-43 with the Milwaukee waterfront. I-894 serves Milwaukeee's southwest suburbs, connecting to I-94 and I-43. 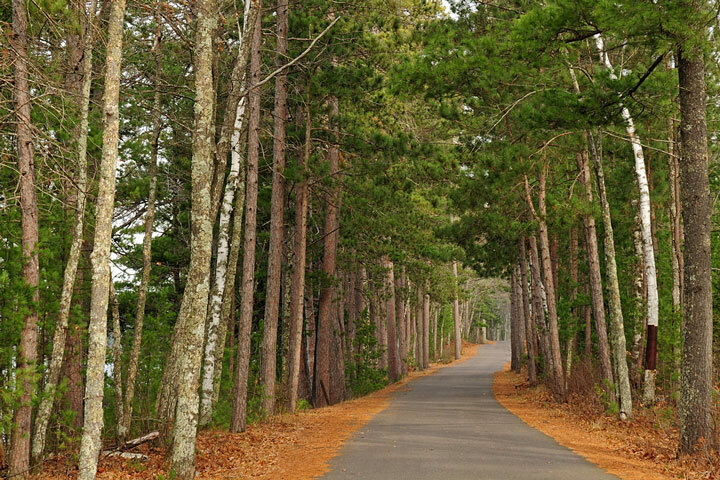 The lakes and forests in northern Wisconsin make a scenic backdrop for an enjoyable road trip. Starting in Rhinelander, travelers will pass through the Northern-Highland American Legion State Forest before arriving at the Lac du Flambeau Indian Reservation which is home to the Chippewas. From Bayfield, visitors can enjoy kayaking or boating trips departing to the Apostle Islands archipelago in Lake Superior. The drive ends at the seaport of Superior, where visitors can take a cruise in the Superior-Duluth Harbor. More information about scenic roads in Wisconsin are available on this America's Byways: Wisconsin page. For more information about Wisconsin's roads and transportation infrastructure, visit the Wisconsin Department of Transportation website. For Wisconsin road traffic conditions, visit the Federal Highway Administration's Wisconsin Traffic Information page. Wisconsin-Map.org is a State Maps reference source.